Loving my new Rosie the Riveter overalls! 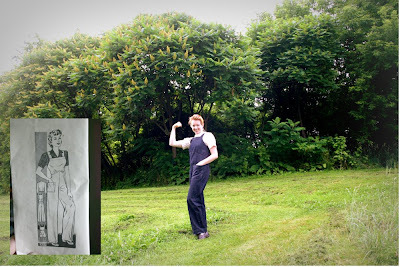 I was thrilled when I found this pattern, having always wanted a pair of feminine but tough overalls to work in. Quick and easy pattern, clearance denim was $2 a yard, I think. Not bad for a $6 or so project. Love 'em! Overalls are my preference for garden work when I'm not in a skirt. There's something fun about them, and modest. I always look for them at the thrift stores and keep a few pairs on hand for heavy work. Yours are great! I wish I could sew like you can. Your truly are rosie the riveter, your spirit and heart!